Saudi Arabia is working hard to restructure its economy toward more industrial production and less dependence on the oil sector, and this effort was reflected in Saudi PPPP 2014, a business event combining two exhibitions: the 12th International Trade Exhibition for Printing & Packaging Technologies (Saudi Print & Pack) and the 12th International Plastics & Petrochemicals Trade Fair (Saudi Plastics & Petrochem). The two shows sparkled with business opportunities in the emerging Saudi marketplace. CENS took part in Saudi PPPP for the first time in 2014. Organized by the Riyadh Exhibition Company, Saudi PPPP (previously known as Saudi PPSG) was held on February 17-20 at the Riyadh International Convention & Exhibition Center (RICEC), a spectacular exhibition facility with 15,000 square meters of indoor exhibition space and a 15,000-square-meter outdoor area. This show lived up to its reputation as a must-go exhibition for the plastic, petrochemical, and printing and packaging industries of the EMEA (Europe, Middle East, and Africa) bloc by attracting 512 exhibitors from 27 different countries including Bahrain, Jordan, Sweden, Belgium, Lebanon, Italy, the U.K., Syria, Denmark, the Netherlands, France, Qatar, and Switzerland. 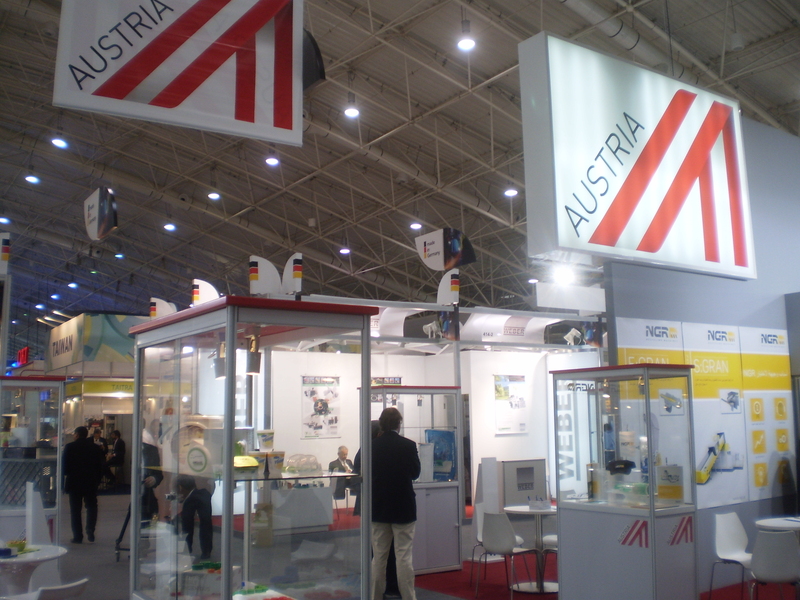 The show drew participation and support from several foreign governmental and industrial organizations, including the Austrian Federal Economic Chamber, Egypt Expo & Convention Authority, Association of the German Trade Fair Industry and The German Engineering Association, Italian Trade Commission, Korea Plastics Processing Machine Industry Cooperative, and Turkey's Ministry of Economy. Ten national pavilions were set up to accommodate exhibits by companies from Austria, India, Turkey, China, Italy, the UAE, Egypt, South Korea, Germany, and Taiwan. 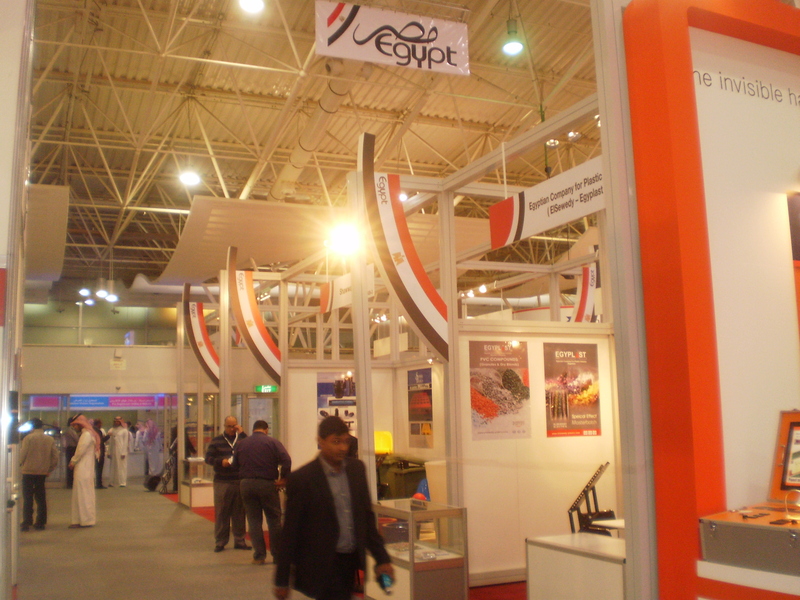 The organizer had earlier expected to see an increase in visitors compared with the 2011 edition of the show, mainly because of the stronger demand for machinery resulting from the restructuring of the Saudi economy. Saudi Arabia has been striving for years to transform itself from world's largest oil producer into a leading olefin and polymer manufacturer, a sensible move given the fact that falling oil prices had a severe impact on nearly all of its non-oil sectors during the global financial turbulence of 2009. Domestic consumer spending and investment faded away, and the country's real GDP growth managed only a minuscule 0.2%. Since oil production, monopolized almost entirely by the government, makes up nearly 30% of Saudi Arabia's economy and contributes 80-90% of the government's revenue, part of the country's economic diversification strategy is to set up more industrial parks and increase the involvement of private enterprises in refineries and polymer production. These efforts have paid off; the country is now the largest maker of such products, and one of the biggest markets for plastics and polymers, in the Gulf Cooperation Council (GCC) area. According to statistics from the Gulf Petrochemicals & Chemical Association, the area's output of PE (polyethylene), including LDPE, HDPE, and LLDPE, for instance, reached 11.54 million tons in 2012, of which Saudi Arabia accounted for 7.88 million tons. Saudi Arabia also dominated the GCC's PP (polypropylene) sector by contributing 4.965 million tons of production in 2012, 29.5% more than in 2007, to the area's overall output of 6.225 million tons. In terms of demand, Saudi Arabia consumed nearly 500,000 tons of PVC (polyvinyl chloride) in 2012, mostly for pipe production, while market demand in the GCC as a whole totaled some 707,000 tons; and over 120,000 tons of PS (polystyrene), largely for packaging, out of the GCC's overall consumption of 156,000 tons. The Riyadh Exhibition Co. emphasized that plastic is increasingly used in packaging to replace conventional materials such as glass and metal in Saudi Arabia, and that local market demand for safe and sustainable packaging solutions is growing rapidly. Demand is driven especially by food packaging requirements at a time when the country's food consumption is forecast to grow steadily at a compound annual growth rate of 4.6% to reach 51.1 million tons by 2015. Saudi Arabia now supplies 70% of the packaging market in the GCC bloc, and is likely to see its domestic market swell by 15% this year. Coincidentally, the outlook for the country's printing sector is also bright, driven mainly by stable economic growth, rising government expenditure, increasing cultural and education activities, and soaring retail sales. The value of the country's printing market has reached US$800 million a year, giving market observers good reason to believe the local printing sector will grow by 8% this year in terms of output value. This will mean more spending on equipment to expand capacity. Another happy fact is that the local population is increasing steadily, showing an ever-growing demand for newspapers and magazines. At the show, complete lineups of plastic and polymer materials, products, and machinery were showcased in wall-free exhibition areas totaling over 15,000 square meter under the four roofs of the RICEC. Bottle-filling lines enjoy considerable business potential in Saudi Arabia. The exhibits included all kinds of chemicals, raw materials, supplies, and compounds, as well as chemical engineering systems, whole-plant equipment, filter systems, blenders, measuring systems, grinders, heat exchange equipment, pumps, motors, valves, plastic furniture, healthcare products, injection and extrusion systems, packaging lines, packaging materials, paper production equipment, wrapping machines, cutting and folding machines, digital direct printing machines, large format poster printers, pre-press hardware, silk screen printing machines, and stitching machines. Twenty-two Taiwanese exhibitors showed off their latest offerings in the Taiwanese Pavilion, organized by Taiwan External Trade Development Council (TAITRA), a semi-official export promoter, at the central area of the Hall 2. Most were delighted with the success of Saudi PPPP 2014 as a business-to-business platform. The Taiwan Pavilion (organized by TAITRA) was located in Hall 2. Bag-making machines were among the hottest products at the show, thanks to the growing demand for packaging and food packing that result from the growing population and burgeoning economy. 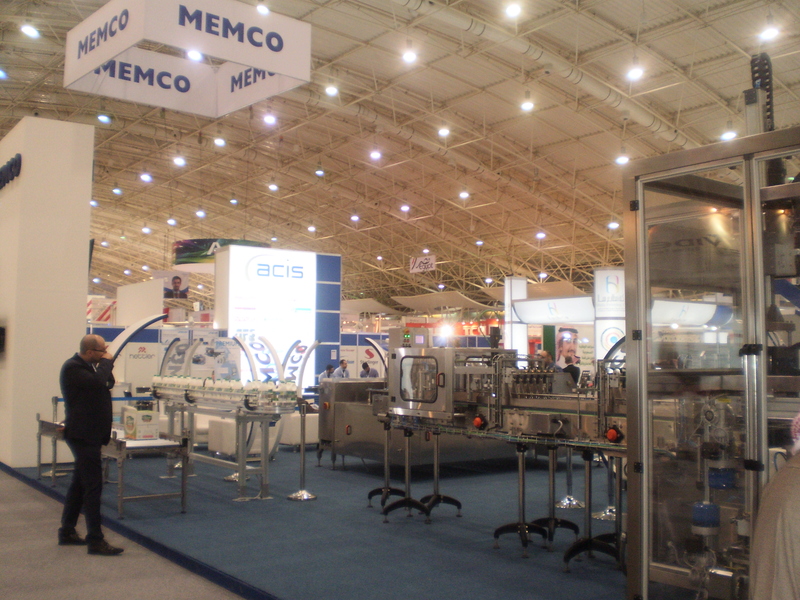 The machines on show included flexible packaging machines, PVC pipe-making machines, and recycling equipment, and booths displaying such equipment were crowded with interested buyers. One of the exhibitors of these products was Avita Machinery Co.< Ltd. of Taiwan, a supplier of printing machines and blown film machines. Representatives manning the company's booth, including its chairman, David Chen, were kept busy introducing the AV-360TP-H T-shirt bag making machine, which is noted for its high performance, smooth film movement, low power consumption, and easy maintenance and cleaning, to a constant flow of visitors during the four-day show. A local buyer reportedly placed an order for the machine during the show. 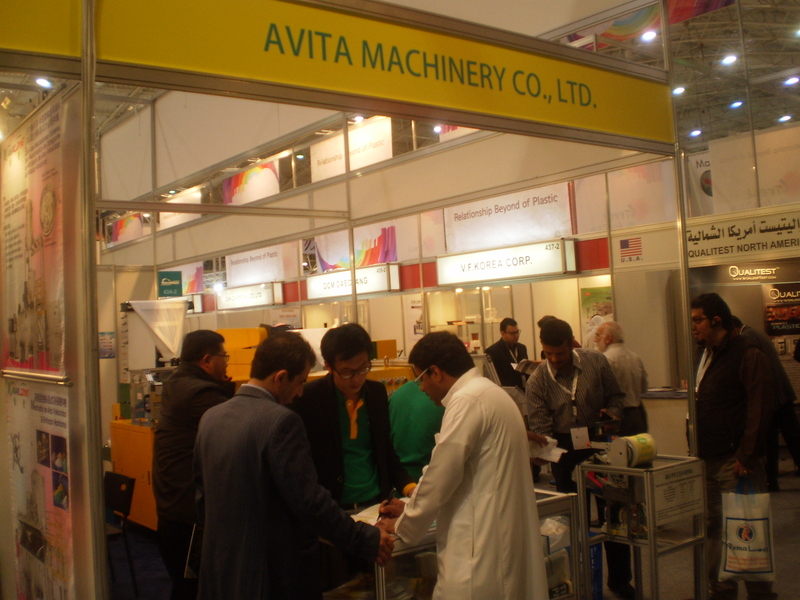 Interested buyers flocked to Avita Machinery’s booth. 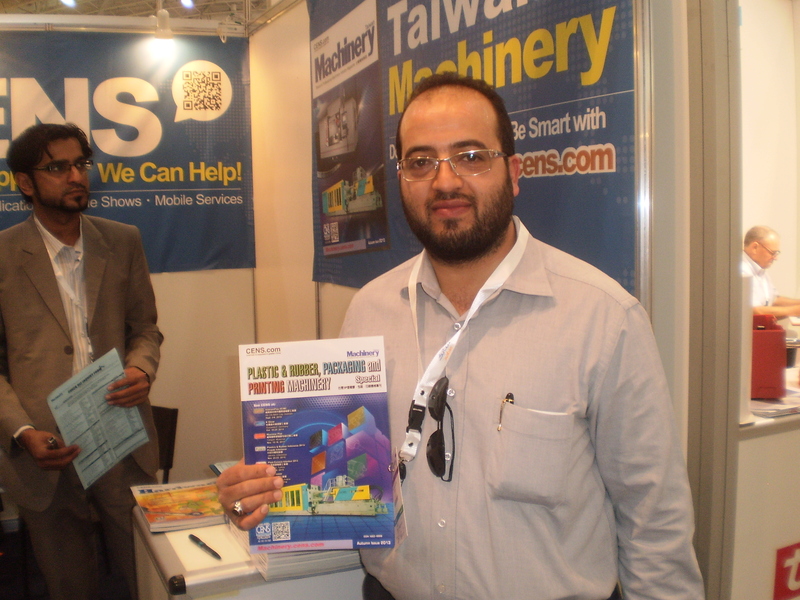 Also excited about great business potential brought by buyers at the show was Zeyad El-Aga, engineer and sales manager from Taiwan Plastic Machinery Center Co., Ltd., a supplier of plastic PE blow film machines and plastic pipe and profile machines. 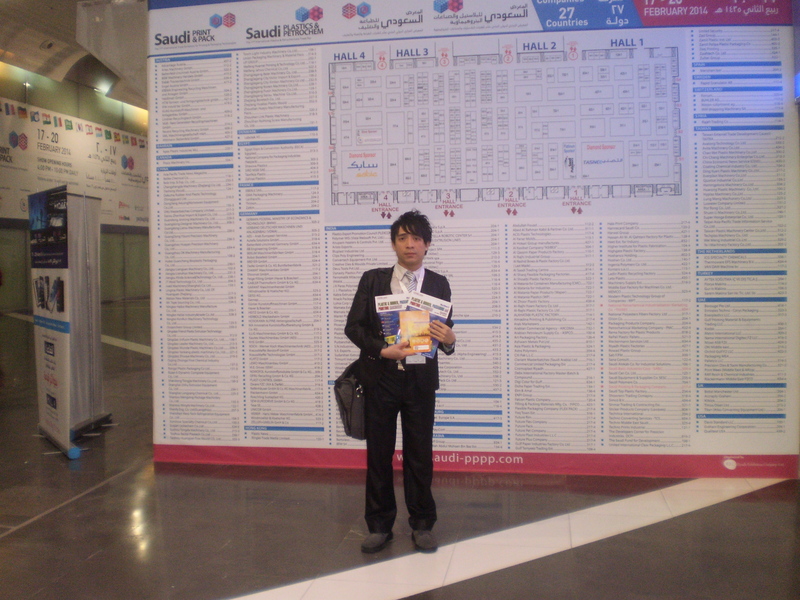 A regular participant in Saudi PPPP, he felt that the number of visitors was up significantly this year, making the show a more promising marketplace. A scheduled short interview with El-Aga was repeatedly delayed and finally concluded half-way through because of the uninterrupted demand on his time by buyers visiting his booth. Zeyad El-Aga from the Taiwan Plastic Machinery Center Co. (right) shakes hands with a local customer after interrupting his CENS interview. A further proof of the show's usefulness a note left on the last day of the show at the booth of Lung Meng Machinery Co., Ltd. of Taiwan, a specialized maker of zipper profile extruders, bag-making machines, and pre-opened bag-making machines, indicating that its high-speed blown film machine, coded LM-AH40T, had been "ordered." The machine had attracted intense attention from visitors interested in the incredible productivity achieved by a built-in AC inverter drive and high torque gear box with reinforced lubrication system. Company representatives spent so much time talking to potential buyers that they had none to spare for an interview. Lung Meng’s LM-AH40T high-speed blown film machine was reportedly ordered during the show. 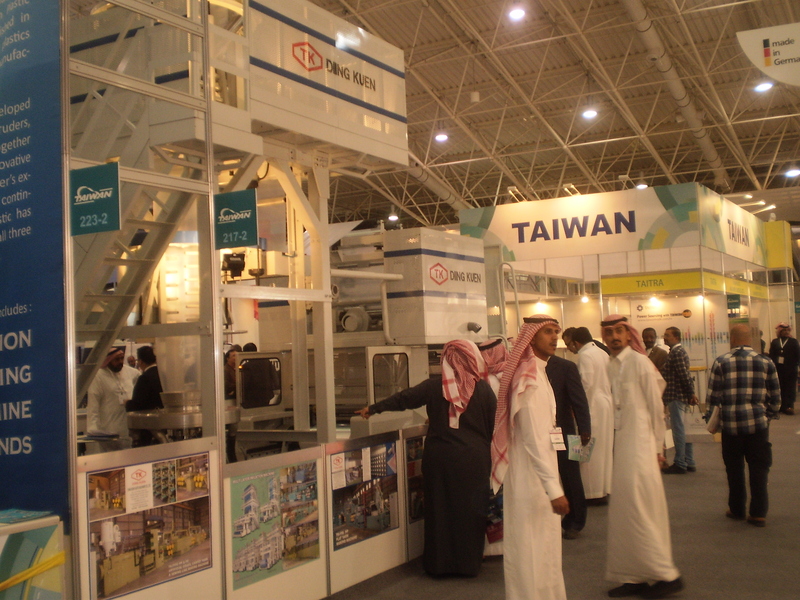 CENS, the largest and oldest Taiwanese export media, traveled to Saudi PPPP for the first time this year. 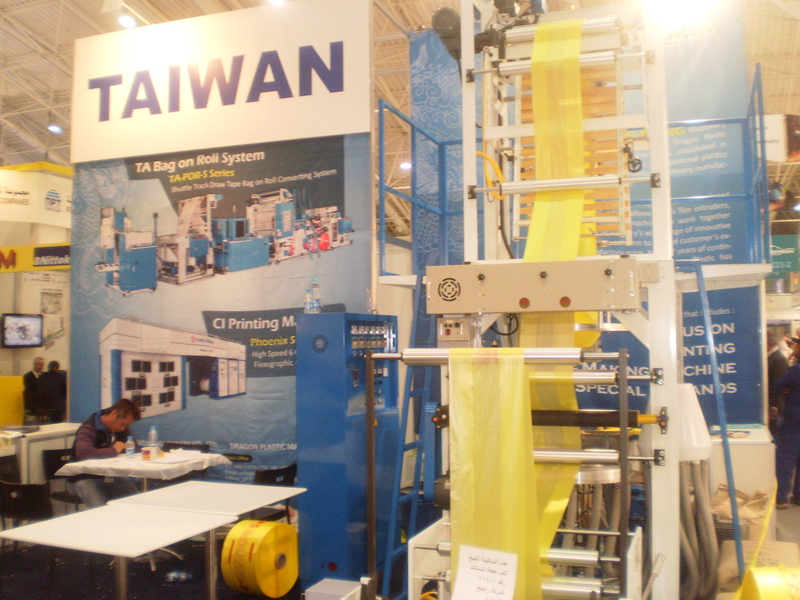 There it met numerous impressive buyers while distributing its publications, including Taiwan Machinery, Taiwan Plastic & Rubber, Package and Printing Machinery Special and Show Express (in Arabic), from its own booth. One of the buyers met by the CENS representative was Essam Abanmy from the Saudi lubricant distributor Energy Birds, who visited the CENS's booth several times to make sure that his requirements could be met after making an inquiry about special products on the first day of the show. He eventually gave CENS a high rating as a reliable, efficient business matchmaker and expressed his trust in Taiwanese suppliers after CENS helped him fill his needs on the spot. Another local buyer, the owner of AL Bustan Nurseries Co., who declined to have his name mentioned in this report, asked CENS to match his company with “Taiwan's best supplier” of garden supplies and related products. Backed by its large supplier database, CENS easily filled this request during the show. Buyers were happy with CENS’s publications and online buyer services. The next Saudi PPPP is scheduled for Feb. 22~25, 2016, at the same place, where in even bigger bigger turnout and a brighter prospects are expected.